Just in time for Spring! ( hurry Spring! ) TM’s new Fun on the Farm takes you on a fascinating trip where you learn how farmers grow their crops, what kinds of animals live on a farm, and where the food in the produce aisle comes from. This latest DVD from TM Books & Video will arrive in stores on February 8, 2011. The 30-minute Fun on the Farm is an engaging foray into the growing cycle. It starts in the spring with planting, then the fields are cultivated, and finally, in the fall, when the leaves change to beautiful shades of red and gold, the farmers harvest their crops using a combine. Host Doodle Rooster and his friends Bell Cow and Harvey Horse take turns introducing young viewers to the marvels of big farm machines all set to a delightful soundtrack of singer/songwriter James Coffey. Take a trip to the “Farm in the Zoo,” a big attraction at Chicago’s Lincoln Park Zoo that teaches city kids about farm life. Then travel to the John Deere Harvester Works in East Moline, IL to see how John Deere makes their combines. Learn about tractors, cultivators, combines, plows, balers and more. Take a laugh-filled trip to the Wacky Farm and lend a hand and work the land as you explore the many chores kids do on a farm. Along with games like “Name the Letter” and “The Cloud Game” (finding clouds that look like animals), your little farming enthusiasts are sure to cultivate new seeds of knowledge and have a great time exploring the many facets of life on the farm. One lucky winner will receive a copy of Fun on the Farm of their own! Tell me about farms in your area - I'm in Indiana so any drive though the country and you'll see many farms. My Mom has a dairy farm right down the street from her. 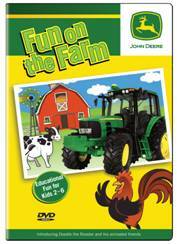 *Follow me @jamaise at Twitter & Tweet this : RT @jamaise #GIVEAWAY #WIN -Fun on the Farm ~ DVD ~ Ready for SPRING!! http://bit.ly/hMRiWq ends 2/20 tweet each day for one entry each ! I'm in rural Minnesota, so we have lots of farms and love to see all the tractors and combines out in the field... at least when it's warmer! Follow your blog with GFC. We live in the city so there's not many farms right around me...but if you drive about 20 minutes south there are a lot of ranches! i'm in missouri and we raise cattle, hay, corn and beans. We live in PA, so some of the farms near us are Mennonite and Amish, seeing the horses out plowing in the spring, and harvesting in the fall just never gets old for me!! I live in Nebraska....you see CORN EVERYWHERE!!!! I am in NJ...and sadly, where I am there are fewer and fewer farms. There is one not too far from me...no animals, just veggies. Thanks for the review and giveaway! I live in LA metro area, so farms aren't really around. We live in central PA and there are many farms in our area - lots of chances to see dairy cows! We live in the cities but can drive not too far to see farms by our house.